InvestoFin-Finance Club of PGDM JIMS organized a special session on Stock Market “Bull, Deer or Bear….A Time to Invest or Fear” on 9th March 2018, from 11:00 AM to 12:30 PM at Auditorium, Building-A, JIMS Sec-5. The session was conducted to educate students about the basic of how to analyse stock market in India. 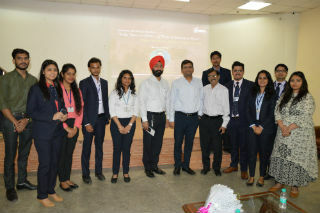 Mr. Kunal Saraogi, Founder and CEO, Equityrush was the resource person. 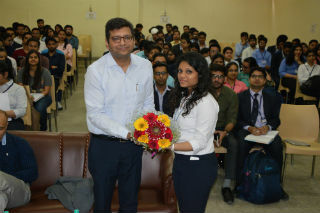 Dr Ashok Bhagat, Dean-PGDM (IB) presented a bouquet of flowers to Mr. Kunal Saraogi. 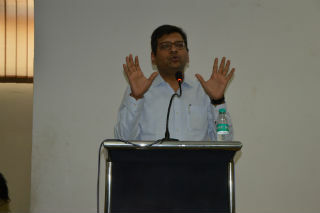 Mr Saraogi discussed various technical jargons of stock market. He talked about three types of analysis that is usually done while evaluating a stock. In technical analysis, he emphasised upon Dow Theory and its application in the stock market. He illustrated Dow Theory with the real time examples. Mr. Saraogi elaborated that how technical analysis can be used to study the trends and movement of stocks through the available charts of the respective stock. The session was an ice breaker for the students who want to step in the world of stock market. 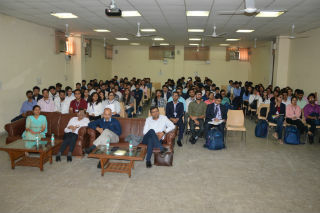 At the end of the activity, students were enthusiastic in questioning the speaker about their queries and two best questions from the students were chosen and awarded by the Speaker himself.